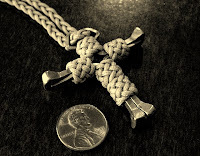 I made this knotted horseshoe nail cross on a paracord loop for lanyard/fob use or to be worn around the neck. It was made with four 2" long horseshoe nails and 0.9mm black nylon cord. After bending each of the nails to shape, I started with about an 8 foot length of cord, not sure how much I'd need, tying a long 4 bight knot on the bottom section's two nails of the cross, held together with locking pliers, doubled the knot, ran the working end under the knot so it came out at the arms junction, then tightened that knot up. From there I wrapped the working end around the top two nails, temporarily held together with a rubber band, and bottom half of the cross in an 'X' a couple of times, bringing the those two halves together, and then tied a 5 lead 4 bight Turk's head knot(which is the base of a Gaucho knot that you can learn from video tutorial), doubled that and tightened it, taking the strand under the center 'X' and out to one side. On one side arm section I continued with the cord's working end to tie a Gaucho knot, and then tightened that knot up. I wrapped the cord again around the center 'X' a couple more times before tying another Gaucho knot on the other arm, running the working end under that knot and out the other side, tightened it, then trimmed and tucked the end strand. A total of around 5 feet of 0.9mm cord was used after tightening. I bent the nails in hand with pliers and the assistance of a tiny anvil with bolt holes that I used for extra leverage in getting the nails to bend. There is a YouTube video tutorial showing how to bend the horseshoe nails with custom made wooden block jigs. I'm sure the jigs made it much easier to bend the nails than the considerable bit of aggravation and time I spent working with them in hand. I even tried heating one nail with a butane torch lighter, to see if that would help, but I guess I didn't heat it long enough and decided I shouldn't press my luck with going down that avenue, and stopped to avoid getting burned. 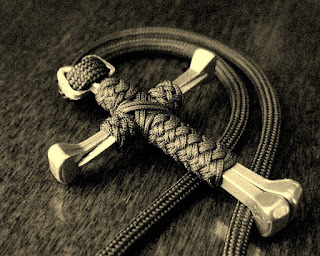 There are quite a few different styles of horseshoe nail crosses, as found in a Google search, including bent and wire wrapped examples, as well as the cut and welded or soldered type. Many different Turk's head knots and variations could be tied around the cross, including wall or crown sinnets. 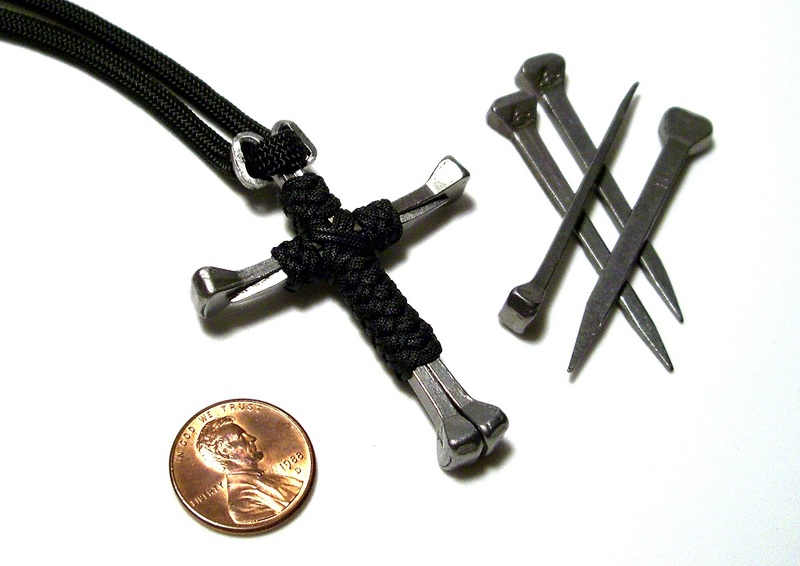 And another knotted horseshoe nails cross with separately tied Gaucho knots, using 1.4mm cord, on a three strand braided thong. I had tied four of the Gaucho knots, then later decided to add another one on the bottom end. I also made a 'Thor's Hammer' with horseshoe nails, knotting over the nails with a T handle Turk's head knot, Guacho knots, and a 3 lead knot, using 1.4mm cord. I was just trying one out with 1.4mm cord, but I'd think I'd like it done with smaller 0.9mm cord and maybe a more complicated T handle knot. Here's a link for some interesting looking horseshoe nail jewelry on etsy and a blog post on that maker, and many other things that can be made with horseshoe nails like these image results from a google search. And a few other uses for horseshoe nails. That is so cool! We have a few guys in our men's group at church making the copper wire cut nail crosses. I haven't gotten into it yet because I've been trying to learn the art of paracord knot work. I definitely need to try this. Thanks for the great idea! @Scot, I've only made the one so far, following the linked video to see how to bend each of the nails, just guesstimating and eyeballing where to bend each one without any specific measurements. I bought a packet of 50 horseshoe nails off ebay to try a few ideas. I don't know if the nails that I bought are harder to bend than others, but it was difficult for me to bend them with just my hands and a pair of small craft pliers(no teeth to chew/mark up the nails). A small pair of locking plier were also used to hold a couple of the nails together as I started the knot work, and a rubber band held the top pair together. The knots could all be tied separately/individually, it just happened that the strand I started with was plenty long enough to go from one knot to the next with adding the 'X' lashing in the center. Stromdrane, I was wondering, where is the best place to get the 0.9 mm cord. I used your picture last night to see what my fans thought of your cross and I am having people request them left and right. So I need to get stuff ordered and started. I love your work I get a lot of inspiration from the things that you create. I have used a small table vice with a cloth buffer to bend my horseshoe nails. I bought my nails at a place called M Bar D Feedstore and Tack place here in Anchorage, AK. Stormdrane,I have learned a lot from from your blog. I have also bought both of JD Lenzen's books. Just beginning to learn different crafts. More great ideas! keep them coming, I love the thoughtfulness you put into your projects! Hi, your work is really cool. I have made one of our bracelets but can't find 1.4MM cord. I found a website for R&W rope but they charge way to much to ship. Any tips. Folks might also be able to find horse shoe nails at a stained glass supply store, we use them to hold down glass pieces while we solder them. love the cross great work. Can anyone tell me what type of stitch/pattern this is in the pic? I think its a solomon bar but im not really sure? @stormdrane Thank you so much sir i've been looking everywhere for two weeks. Now I just have to figure out how to put an adjustable clasp on it. I really like the Thor's Hammer one. 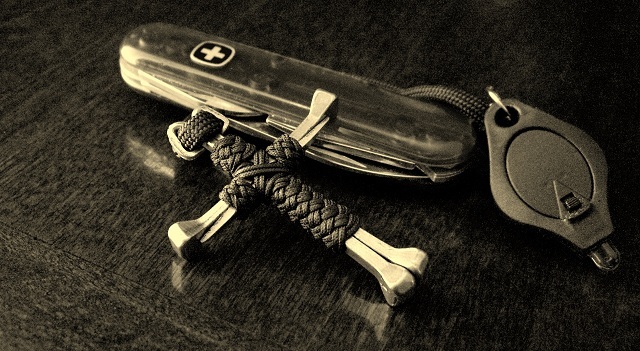 I left Christianity and the cross thing gets old to me. I sincerely want one of those. Now, where's my horse. . .
Would you be inclined to sell one of those Crosses? Hello from Stockholm, Sweden. Love your work, bravo. Do you take comissions? I would be interested in your services for a small job. If yes, could you perhaps share an email address where I can reach you? I love your blog. I've been following you for years, on here and Instructables. My GF collects cross necklaces, and I think this would be an awesome piece for her collection. I don't know if it's been suggested yet, because I haven't read through all the comments yet, but I would love to see this as an Instructable. @clayton, If trying to tie the knots with one continuous length of cord is too difficult, you can certainly just tie each individual knot with a separate strand of cord. With the tail end of the last knot's cord, wrap it around the center of the cross in the 'X' pattern, then tuck the end. @ Stormdrane, love your work!! I just got into making stuff with paracords and your videos started it all. Thanks! Do you know of any tutorials for the chain mail weave? 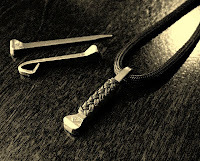 @Anonymous, The 'Chainmailed Endless Falls' pattern is shown in JD's book, 'Paracord Fusion Ties: Vol 1'. I have checked out your blog for quite some time now, and I have seen a lot of crosses you've done. But that's the only symbol I've ever seen on your blog - so, out of curiosity if you ever were to do a different symbol, any kind, what would it be? @Victor, I have done a Thor's Hammer pendant, and there are pineapple knot patterns that have a 6-pointed star in them(Star of David), and some flat patterns also show a 6-pointed star and 5-pointed stars for a Pentacle pattern for those that wish to tie them. You have inspired me to keep trying. Please keep the videos and pictures coming, I am learning a great deal. Thank you for sharing you talent!! I love your work. Do you sell your creations? I am very interested in purchasing some of the crosses for me and my friends. Found your work inspiring. I have bought some 0.9mm and horseshoe nails to attempt this work. What did you use to thread the 0.9mm cord? 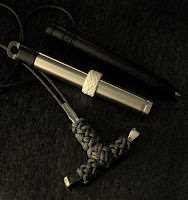 It is so small that the needle I have for my 550 paracord will not work. @Rob, I used my small #1193-01 Perma-Lok lacing needle with the 0.9mm cord and 1.4mm cord. I really want to learn how to make one of these! Great work! You previously mentioned you try not to sell your creations. Would you "trade" one if I made a donation to your fav charity? I'm former Army Officer and love anything cool made with parachute cord. I have a couple questions about this. Is it 1 piece of nylon? Is this weave like the one you posted in YouTube the double bight turk head? Where do you start on the cross? Please answer. Thank you in advance. @Tomas, I used a long single strand of cord to do all the knot work on the cross. I started at the bottom/foot end of the cross and worked up from there, as described in the blog post. You Sir, are an artist. Your work inspires me. I wish I had the mind's eye to see these things. I really like the cross. I notice you refer to the small cord as 0.09 mm or 1.4 mm I am guessing that is from a specific retailer? Also, with the smaller cord, do you know of a place to get it in silver? @Kevin, I've bought the smaller cord from ebay, fixmyblinds.com, and RW Rope, but it's also available from GPJ Rope and Nibrol.com. I love the knotted horseshoe nail cross! Do you sell this model on Ebay or Amazon?